Background: The purpose of this study was to assess the acute ablative characteristics of transurethral convective water vapor (steam) using the Rezūm® system in men with benign prostatic hyperplasia through histologic and radiographic studies. Methods: Seven patients were treated with transurethral intraprostatic injections of sterile steam under endoscopic visualization followed by previously scheduled adenectomies. 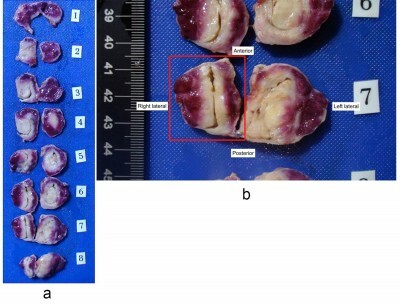 The extirpated adenomas were grossly examined followed by whole mount sectioning and staining with triphenyl-tetrazolium chloride (TTC) to evaluate thermal ablation. Histology was performed after hematoxylin and eosin staining on one prostate. After review of results from the first patient cohort, an additional 15 patients with clinical benign prostatic hyperplasia were treated followed by gadolinium-enhanced magnetic resonance imaging (MRI) at one week. Results: In the first patient cohort, gross examination of TTC-stained tissue showed thermal ablation in the transition zone. In addition, there was a distinct interface between viable and necrotic prostatic parenchyma. Histopathologic examination revealed TTC staining-outlined necrotic versus viable tissue. Gadolinium-enhanced MRIs in the cohort of 15 patients demonstrated lesion defects in all patients at 1 week post-procedure. Coalesced lesions were noted with a mean (± standard deviation) lesion volume of 9.6±8.5 cm3. The largest lesion volume was 35.1 cm3. Ablation using vapor was rapid and remained confined to the transition zone, consistent with the thermodynamic principles of convective thermal energy transfer. Conclusion: Thermal ablation was observed in all specimens. The resulting coalescing ablative lesions, as seen on MRI, were confined to the transition zone. These studies confirm the ablative capabilities of vapor, validate the thermodynamic principles of convective heating, and allow for further clinical studies.